If you’re undecided about what to do on July 4th, here are a few activities you might check out in the 805. 4th of July Fireworks Spectacular event at Camarillo High School planned again this year by the Camarillo-Somis Pleasant Valley Lions Club. Gates open at 4pm. The 15th Annual Fireworks by the Sea is all day long, from 10:00 a.m. to 10 p.m. on July 4th at the Channel Islands Harbor, The day includes food, exhibits, live entertainment, kids’ activities, Artists’ Market, Live Music, Food Booths, Water Taxi Rides, Face Painting, Gigantic Inflatable Fun Zone, Rock Climbing Wall, Petting Zoo, Pony Rides and Farmers Market. Fireworks start at 9 p.m. The day also features the 15th Annual 4th of July Parade at 10:00am! Start your 4th of July with the 9th Annual Channel Islands 4th of July 5K & 10K races on 4th of July at Hollywood Beach/Oxnard State Beach Park. The City of Ventura 4th of July Street Festival and 37th Annual Pushem-Pullem Parade attracts up to 50,000 people, with the parade starting at 10:30am., followed by nine blocks of Main Street and several side streets filled with 300 artisans, food booths, nonprofit organization displays and four stages of continuous live entertainment. Official Street Fair start time is 10:00am. until 5:00pm. Free events to the public and free shuttle service the event from the Ventura County Government Center. Call 805.654.7749 for more information. Ventura Rotary’s 4th of July Fireworks Show and Family Festival is at Ventura College Athletic Field, 4667 Telegraph Road. Gates open at 4pm. Fireworks at 9pm. Buy tickets in advance. See Despicable Me for only $1 at the Century 16 Ventura at 10am on the 4th! The Ojai Independence Day Parade takes place on July 4th in downtown Ojai at 10 a.m. At 5 p.m., Nordhoff Community Stadium opens its doors for a flag ceremony, food booths, games and rides, entertainment and fireworks at 9:15 p.m. There is a 1/2 mile and 1 mile Youth Freedom Run fun run 4th of July morning. On July 3rd, the Air National Guard Band of the West Coast performs a free concert at Libbey Bowl! Fillmore & Western offers 1 hour train ride all day, then a special Firecracker Train that departs at 6:30pm, serves a delicious BBQ dinner, then stops on the tracks for a great view of the City of Fillmore Fireworks show. Fireworks show planned at 9pm at Harding Park, 1300 E. Harvard Boulevard. On Sunday, July 8th, the City of Agoura presents a FREE Concert at Chumash Park followed by a fireworks display! The concert starts at 6pm and features the lively music of Platinum Groove. Bring chairs, blankets, picnics, toys, etc. No pets allowed. Food, drinks, glow sticks available for purchase. 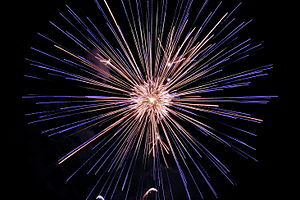 The City of Moorpark presents its 3rd of July Fireworks Extravaganza at Arroyo Vista Park, 4550 Tierra Rejada Road. Festivities start at 4:00 p.m. Admission is $4 per person, with children 4 & under free! Visit the City of Moorpark website at http://www.ci.moorpark.ca.us or call 805.517.6300 for more information. Visit the Reagan Library 4th of July Celebration between 10 a.m. and 3 p.m. Festivities, include music, family entertainment, presidential look-alikes, face painting, storytelling and childrens’ games. Enjoy all-American food and patriotic music. All 4th of July activities are FREE; however, regular admission rates apply for those visitors who also visit the Museum exhibits. Call 800.410.8354 for more information. The 42nd Annual Fourth of July Festival and Fireworks Extravaganza is at Rancho Santa Susana Park, 5005 Los Angeles Ave., Simi Valley. Gates open 2 p.m. Fireworks start at 9:20 p.m. Event features live bands, kids activities, dunking booth, crafts and food vendors, beer and wine stations. FREE admission! The annual Conejo Recreation and Park District and City of Thousand Oaks 4th of July Fireworks Spectacular is launched from the hill behind the Hillcrest Center of the Arts in Thousand Oaks. Best viewing will be at the Oaks Shopping Center and Janss Marketplace parking lots. Fireworks start at 9 p.m. Call the Conejo Recreation and Park District for more information at 805.381.1247 . Other CRPD events around the city include a Pancake Breakfast and Home Run Derby in Newbury Park, Concert in the Park featuring the Conejo Pops Orchestra and Free Swimming! The Janss Marketplace will once again host its annual 4th of July Fireworks Spectacular event from 5-9pm with an outstanding viewing of the Thousand Oaks fireworks display on the top floor of its parking structure and the Fountain Courtyard areas. Lots of music entertainment, kids’ activities, great food for sale and more! Details will be made available soon. Get your Independence Day started out right by visiting the 2nd Annual Miller Family YMCA 5K/10K, Classic Car Show and Parade first thing in the morning in the Dos Vientos section of Newbury Park!! Kids fun zone, entertainment and more. At 10am Muvico Theater is hosting a free screening of Monsters vs Aliens! The Oaks shopping mall will also be an official viewing location for the City of Thousand Oaks fireworks, with live music and kids’ crafts starting at 6pm on the Muvico lawn. The Stagecoach Inn Museum in Newbury Park is opening its doors to the public for free from 1-4pm in honor of both its own birthday and the Country’s birthday. And did someone say…barbershop quartet and free ice cream!!?? Bethany Church on the Hill in Thousand Oaks once again opens its incredible views to the public with a 4th of July Celebration starting at 5pm. Free music, family fun, food for sale and some of the best views of the Thousand Oaks Fireworks Display in town! The City presents its 43rd Annual 4th of July Parade followed by music, inflatables, games, popsicles, etc. at Berniece Bennett Park until noon. Boy Scout pancake breakfast before the parade! Time to party! ← The Newest “Hip Foodie Spot” In The 805 Opens In Downtown Oxnard!